That's it from the SheBelieves Cup - where England have been crowned champions for the first time. England manager Phil Neville speaking to BBC: "The players that came in delivered. It was fantastic. We have a style that we want to play and we have 23 players that are good enough. "It was a sensational performance. The players made an impact and they are causing me problems. I wasn't that bothered before the tournament whether we won or lost, I just wanted to see an improvement and we go home knowing we are definitely in the right direction. "We just keep listening to USA, Japan and Brazil talk about how good we are. But we remain humble, have fun and enjoy moments like this. "You don't get many chances to get your hands on a trophy. It is my first as a manager so I am just going to enjoy it. It's great for everybody but I think we have bigger things to aim for. "We will enjoy it but tomorrow we will look forward to the April camp. There's bigger things to come. On Izzy Christiansen's injury: "It looks bad. But she's strong. We will access her in the monring. We have lost Jordan Nobbs already in the build-up. Christiansen is vital to our squad. Hopefully she will be okay." It's that winning feeling. There are so many positives to take from this tournament and you get to pick up silverware. Phil Neville showed faith in those players today. 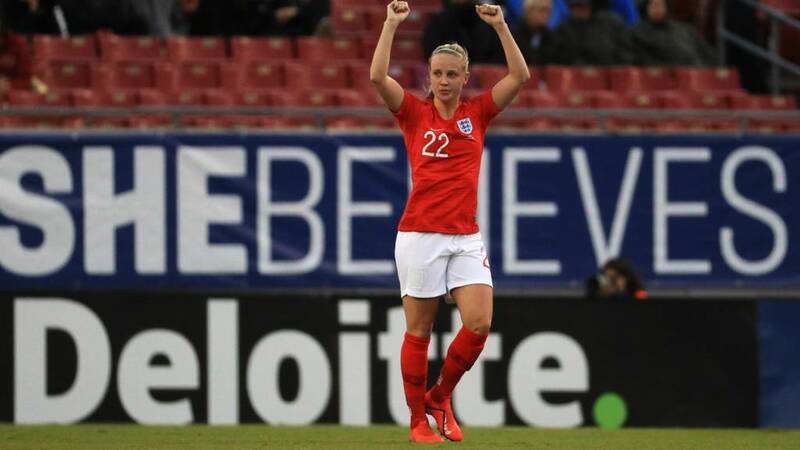 "Phil Neville still went mad at half-time"
England goalscorer Karen Carney speaking on BBC 4: "It's fantastic to win it before the World Cup and it's great preparation. We're so happy. "It feels really good - the energy and the mood. We've beaten Japan and got two other good results. "It couldn't have gone better. "Phil Neville still went mad at half-time...about standards! But that's Phil. He wants us to be better and he demands more from us and that's what we want." For England to go over to the USA and win this, makes a big statement and ticks a lot of boxes... Japan were unlucky not to get a goal but it was great for England to keep a clean sheet. In the friendly games we have been wasteful in front of goal but the goals we have scored in this tournament has been fantastic. We have been more clinical. Japan's defending could have been better but England have improved so I want to look at those positives. Nick Price: What a perfect way to set ourselves up for the World Cup. England made the #SheBelievesCup decider look so, so easy. Jan: I was nervous, I have to admit, but the @Lionesses have done us proud tonight. On to the World Cup now. This is the fourth year of this friendly tournament and Phil Neville's gone one better than last time out. And they've done it by beating a team in their World Cup group. That will send out a statement to the rest of the world. That was a fantastic, professional performance. They had to defend in the second half and they did. Brilliant from an England perspective. They've won it in America, on the home soil of the best team in the world, and they've done it in a World Cup year. Japan have been very wasteful in front of goal and that continues into injury time. England will want the clean sheet and it looks like they're going to be handed it with relative ease. I love the fact that Phil Neville has said he doesn't know his squad yet as it gives people a chance to fight for a place. But you would think this is his 23, along with the players left at home through injury. England are tiring now (aren't we all). They're a period of injury time away from the title. Rikako Kobayashi pummels the ball on target from close range and Carly Telford shows off her reactions by getting down low to block the thunderbolt. A lesser spotted yellow card! Steph Houghton goes in the book for a foul on Hina Sugita and the Japanese earn a free-kick wide on the left. It's flown into the box and headed out for another corner. More subs! Fran Kirby is on for goalscorer Lucy Staniforth. Chioma Ubogagu has shown pace on the left wing. But she needed to turn back and keep the ball. There was nobody making that run into the box. And now Kobayashi with an incredible turn and volley! Carly Telford produces a wonderful save to force it over the bar for the Lionesses. Chimoa Ubogagu makes a blistering run up the left, she skips past a couple of defenders but there's no one in the box. Hina Sugita heads INCHES wide for Japan! Everyone thought that was dropping in. Kumi Yokoyama sent a lovely ball in from a tight angle, too. England have a free-kick, dead centre about 30 yards out. It's taken short, Georgia Stanway goes for the spectacular from distance and it dips over the goal.